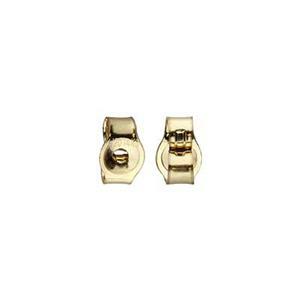 14/20 Gold-filled 3.8x2.5mm Light Ear Clutches for up to 22 gauge or .7mm posts. Engage the Clutch! To engage something means to fit two parts of something together. Whether your car – or your earrings – clutches are a necessity to get the job on the road! Our GF3560 – 14/20 Yellow Gold-Filled Light Earring Clutches. These will fit any earring posts that are 22 Gauge or .7mm. Made here in the USA, with an anti-tarnish finish. View our full line of Earring Posts and Clutches.